MWC 2017 has been the house of tech innovations for many companies. Most of the companies wait for MWC to first showcase their products to the world. Meizu, though didn't actually brought a new smartphone to MWC this year, is not out of the race at all because this new technology which Meizu has demoed is the world's speediest fast charging technology. 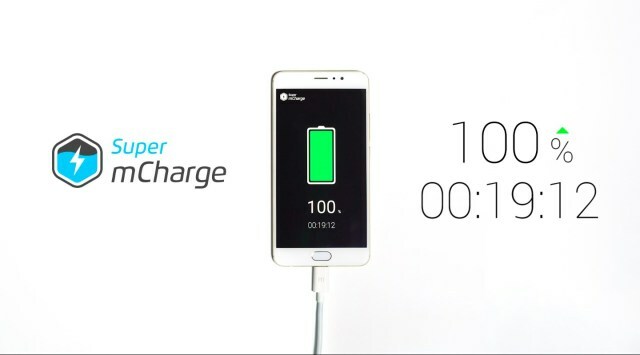 Super mCharge fully charges a 3000mAh battery in 20mins. It is the third generation of Meizu's fast charge technology. The technology is based on the first generation high voltage fast charge and second generation low voltage direct charge technology. The Super mCharge charges 5 times faster than the normal charger and 3 times faster than any other fast charge technology. The mattering thing in the Meizu's Super mCharge technology is that the battery doesn't get heated up even when the input voltage is 11V or 5A that generates a maximum power of 55W that carries 4 times more current than do the ordinary battery. Super mCharge adopts Amperex Technology Limited (ATL) batteries that are claimed to have 4 times more charging capacity than the ordinary batteries. These batteries retain 80% capacity even after 800 charge cycles.